Pigeon hunting is a very popular sport in many countries and is increasing in others including the US as hunters learn about their availability and ease of decoying. Pigeons are attracted to SWD’s similar to, or more than doves and ducks. 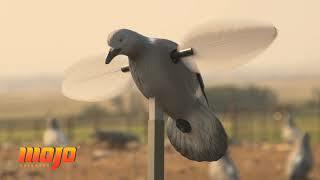 The MOJO Pigeon is a realistic simulation of a landing Wood Pigeon that features a realistic body with the standard MOJO Mounting Peg, direct drive motor with magnetically connected wings. Operates up to 16 hours on 4-AA batteries (not included) and equipped with a new heavy-duty on/off switch. Complete with 3-piece metal mounting pole. Provides a new off-season sport for most hunters.